These photographs are from a beautiful farmhouse in the tranquil village of Brotheridge Green near the city of Worcester. Worcester is famous for many things, Royal Worcester Porcelain, Lea and Perrin Worcester Sauce, Berrow’s Worcester Journal which claims to be the oldest newspaper, and indeed it was also the hometown of the composer Edward Elgar. The owner of the farmhouse asked me to come and look at their downstairs cloakroom which had existing quarry tiles fitted. They were becoming frustrated that they couldn’t get the area to look clean and were considering replacing the floor. 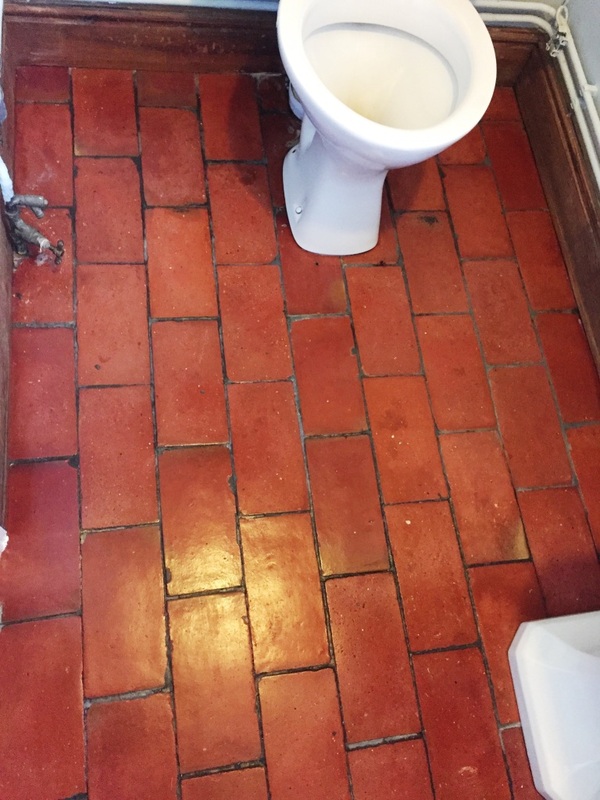 The owners of the property had used every cleaning product they could find and scrubbed for hours to try and get these quarry tiles in their cloakroom clean. 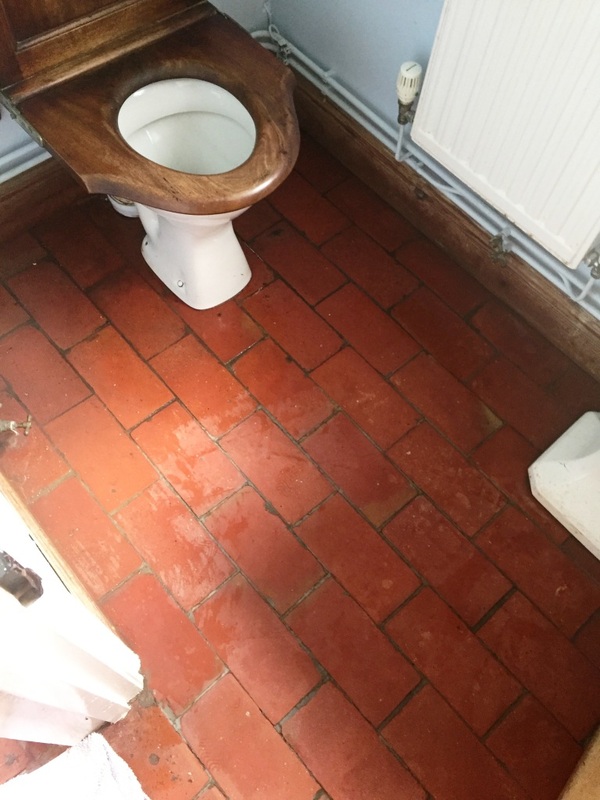 The problem with the tiles was a build-up of ingrained dirt over time as the tiles had not been sealed, so no amount of cleaning with household products would have helped. There was also an issue with salts rising through the tiles which was making them look worse, common in properties of this age. Following my inspection, I explained to the customer what I could do to bring the tiles back to life. I completed a quote for the work that evening which they gladly accepted, and the work was scheduled in. On day one of the job my first step was to sweep away any loose debris from the quarry tiles. I then tackled the floor with Tile Doctor Pro-Clean this is a heavy-duty alkaline cleaner which is safe to use on Tile and Stone, in concentrated form it can strip away sealers and grease and was perfect for this job. As I was working in a confined space I opted to complete the job by hand using a deck brush and scrubbing brush to work the solution in after leaving the Pro-Clean to dwell and soak into the floor for ten minutes. I then extracted the resultant slurry off the floor with my wet and dry vacuum and repeated this process until I was happy the floor was as clean as it could be given its age. 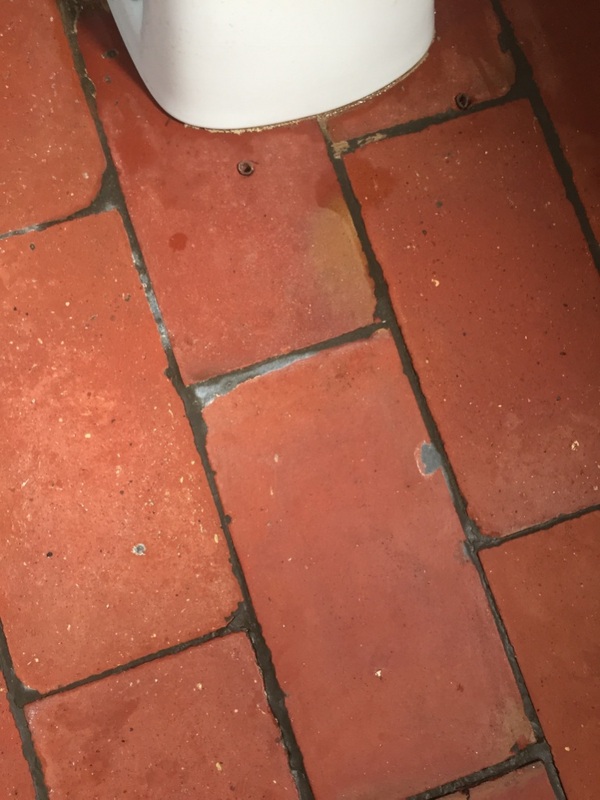 I then finished the cleaning of the floor with an acid rinse using Tile Doctor Acid Gel to remove grout stains and counter potential salt efflorescence issues which are a common problem with these old floors where no damp proof membrane has been installed. The floor was then rinsed again with water, dried with the wet vacuum and left to dry off fully overnight. When I returned the following morning, I checked the floor was dry using my moisture meter; this is important step as a damp floor will effect the ability of the sealer to cure. I decided to seal the Quarry tiles with Tile Doctor Seal and Go Extra, which is a semi-gloss breathable sealer to allow for any damp issues and applied four coats allowing each coat to dry for approximately 30 minutes before adding the next. This gave a nice natural finish letting the colour of the quarry tiles shine through. The customer was very happy with the result and is looking to get the rest of the Quarry tiles in the house cleaned and sealed in the future. They were very happy that the floor didn’t need to be replaced. Mark was professional, reliable and provided an excellent all round service. 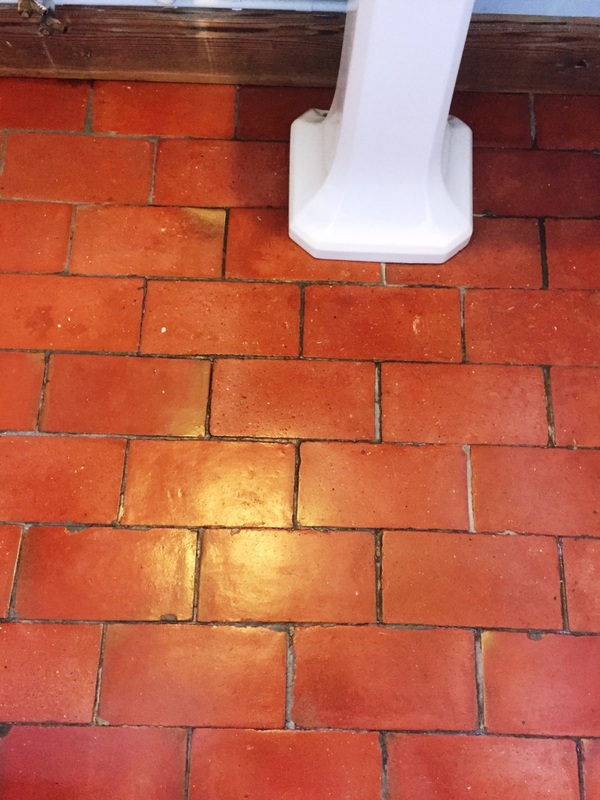 I could not find anyone locally to carry out the work on the discoloured grout on my ceramic floor tiles – they were ruining the look of my new kitchen – so finding the Tile Doctor was a real godsend . Mark came promptly and was very reassuring – the work was done quickly and efficiently and the finished result was amazing – I love my tiles again ! Mark was pleasant and helpful – nothing was too much trouble and it was a pleasure to have him working in the house – he also gave me some good advice as to how to keep the tiles looking their best . Thanks to him an experience I had dreaded turned in to a very positive one – so a big thank you to Mark and the Tile Doctor – I would recommend you to anyone who has a problem with their tiles .